Should I play without shoulder rest or with shoulder rest? Often this subject of whether it is better to play without shoulder rest or with shoulder rest comes up when talking with colleagues, other times students ask me about it, therefore here is my opinion and some advice, hoping they can be useful. At present I play without shoulder rest, but I learned to play with the shoulder rest and I used it for many years. I have to say that, like everybody, I changed many shoulder rests and chin rests, always trying to find that one that would really fit until, in order to solve the problem, I decided to eliminate it. How could they play without shoulder rest in the old times? By reading about the lives of performers, one finds out that, until about the first half of the 20th century, all violinists and violists (famous or not) used to play without shoulder rest, simply because it had not been invented yet. It seems that it was invented, or at least promoted a lot, by Yehudi Menuhin in the '50s and, since then, an infinite number of models have been invented. Therefore I wondered how they did and why they managed to do it while now it seems that it is impossible to play without shoulder rest, that the shoulder rest is an integral part of the instrument. The advocates of the use of the shoulder rest say that it makes shifting easier, especially the descending ones, and I agree with this. They also say that in the past they didn't use the shoulder rest because the music did not require many shifts, but I disagree with this, because already during Stamitz's and Mozart's times, the viola player (and obviously the violin too) would get to play in 7th position, for example in Mozart's sinfonia concertante. In my opinion, however, the risk of using the shoulder rest, is that the player gets used to holding the violin or the viola by holding it tight between chin and shoulder. In order to do so, it is necessary to press with on'es head on the chin rest, therefore all the weight of the instrument will be hanging in front of the player who must sustain it by using the neck's muscles which remain always tense. This in the (not so) long term, causes pain in the left back of the neck (not to mention other troubles caused by this constant tension) especially to violists, due to instrument's bigger weight. I too was taught to do so and this is what the majority of people who play violin and viola do and, indeed, there are a lot of people who have aches and pains and various other problems. The shoulder rest should simply serve to help fill the gap between chin and collar bone, especially for players who have a long neck, not to hold the instrument jutting away from the player. I warmly advise you against doing this, especially if you already have pain. When I stated to play and study baroque music with so-called "original" instruments, I had to play as they used to do in older times, that is play without shoulder rest and chin rest. So I started doing several experiments, trying not to take a too uncomfortable position with my shoulders, head and left hand. I noticed that to play without shoulder rest nor chin rest I had to keep my viola on my collar bone at a narrower angle than I had been taught to do with the shoulder rest (that is, less open toward the left) in order for the viola not to slip down, without having to hold it tight between chin and shoulder. I have to say that I never felt very comfortable, even though there were not many shifts. When I was not playing baroque music, I would go back to using shoulder rest and chin rest. Practically, I had to play in two different positions and I did not like this. 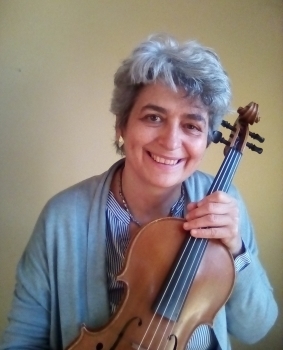 Therefore, trying to uniform my positions, I began to change my chin rest and use one over the tailpiece, which enabled me to keep my viola at a narrower angle. Then I read a book in which the great violist William Primrose talked about this with a colleague and of how to teach to play without shoulder rest and I found precise indications. The instrument should rest on the collar bone and on the left hand, forming a 45° angle with the player. This way it is balanced and does not slip down and the player does not have to try to hold the instrument by pressing it between chin and shoulder. Furthermore, the player's head should not press on the chin rest but should be straight and free to move. There is a tendency to try and hold one's instrument fixed into one "correct" position. Instead, your instrument should be allowed to move slightly, to the right and to the left, following the various movements of the left arm and the body. It would be a bit like walking or cycling: we are never in one fixed position, yet we are balanced and do not fall. It is necessary to find the balance for the instrument. With regard to this, William Primrose's and Kato Havas are similar, about "not holding" the instrument tightly. (See the "no hold" of the violin/viola). Obviously, it took me some time to find the balance, like for cycling, but eventually I found it. As to shifts, they are done by letting also the instrument move a bit up and down, following the movement of the arm. Perhaps, in this case, yes, resting (not pressing) the chin a little for the descending shifts, but loosely. To conclude, I do not impose on my students to play without shoulder rest: I explain them its function and the concept of finding the balance for the instrument. If they are happy with their shoulder rest, let them continue. Indeed, in some cases, if the player has a strong fear of dropping the instrument by playing without shoulder rest, then I'd recommend it, but always emphasizing not to press with the head. But if they are not happy with their shoulder rest and the many others they have been experimenting with, it is worth trying to do without, and begin to eliminate the primary source of various tensions and physical blocks in their playing.